Eleven years: Peck would give everything to have had those eleven years back. For one thing, he wouldn’t have messed around with those women in Indianapolis. If he’d gotten a regular doctor job, he’d be driving the big bucks now, fixing everything from Aarskog syndrome to Zika virus. I’m fond of cop humor. Cop humor is black humor, often profane humor, the humor of people who’ve seen the worst things life can dish up, and have found ways of coping. John Sandford’s novels about Minnesota cops are full of cop humor, which is one of their charms. In comparison to his Prey novels, starring Lucas Davenport, his Virgil Flowers novels tend to lean more heavily toward slapstick. 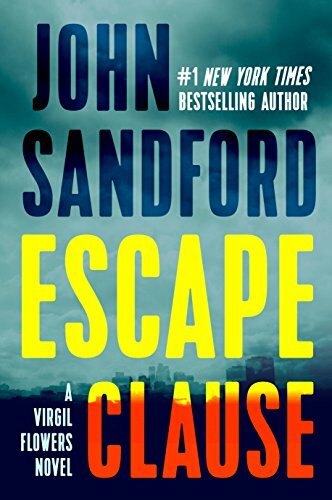 Escape Clause is perhaps the most comic of his novels to date, though there are several murders along the way. In Escape Clause, we begin with the theft (kidnapping?) of two rare tigers from the Minnesota Zoo. There’s no mystery in this story – it’s a thriller. We know who the bad guys are (an eastern medicines doctor and a few thugs), and the suspense is in how fast the Minnesota Bureau of Criminal Apprehension, in the person of Virgil Flowers (the only guy they can spare because of security demands at the Minnesota State Fair during visits by presidential candidates) can figure out what’s going on and stop it. Virgil is a good cop, though not a very good shot, and generally reluctant to even carry a gun. He also tends to take a lot of pratfalls in this outing. Simultaneous with this job, he gets involved with stopping some thugs, hired by a sweatshop owner to beat up his girlfriend’s sister, who’s doing sociology research on the illegal alien workers. It’s all a lot of fun, and it’s mostly dirtbags who get killed. The climax is obvious a mile away, but no less enjoyable for that, on a visceral level. An interesting new element in this story is the character of “Father Bill,” a Catholic priest who leads an odd life. He works as a supply pastor for the Minneapolis-St. Paul diocese nine months of the year, and is celibate then. During the summers he works at a resort and has a girlfriend. This is kind of jaw-dropping, but I suppose it’s not unthinkable in today’s church. Virgil, whose father is a Lutheran pastor, makes some small effort to talk him over to the Protestant side. Anyway, I had a good time with Escape Clause. Cautions for lots of bad language and adult situations, also the death of an animal (almost always more traumatic than human death in a novel).